Escape rooms are really popular at the moment and always remind me of the classic 90s game show The Crystal Maze - which I loved as a child and always wanted to take part in when I was younger. 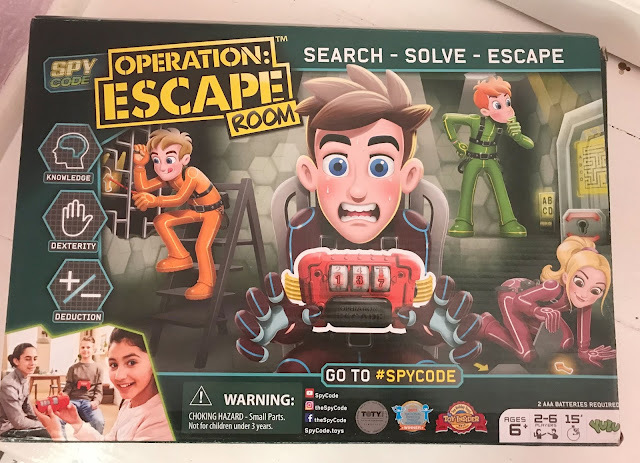 Well now children can have a taste of this with new game Spy Code - Operation: Escape Room . A nerve-racking and very fun game where you have to beat the clock and free your teammate by completing challenges before the time is up. Operation Escape Room is a game where one player is strapped into a timer strap, that they can't escape from, the other players have to complete three challenges to find the keys before the timer runs out so they can free their teammate. The game is really easy to set up with step by step instructions so it was set up in no time at all as we just had to add batteries and click a few pieces into place. 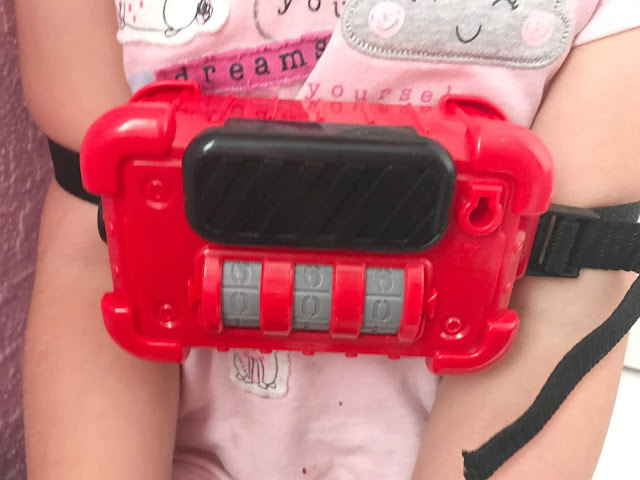 It is recommended for children aged six plus but my five year old really enjoyed playing the game with her older sister and cousin. 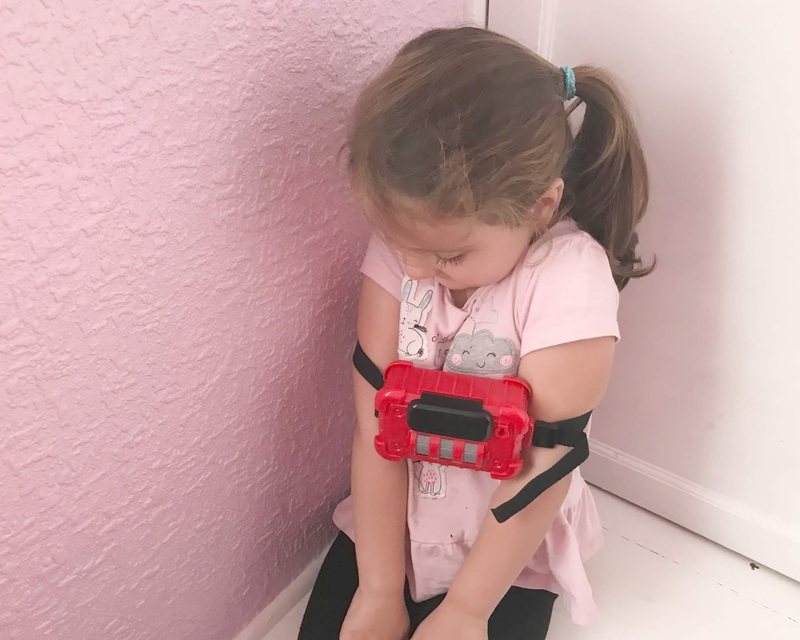 There are also three different difficulty levels so you can play the easier level with younger children and the more difficult one with older children. As soon as the first player is strapped into the timer strap the clock starts ticking and it is a race against time to complete the challenges to free them! 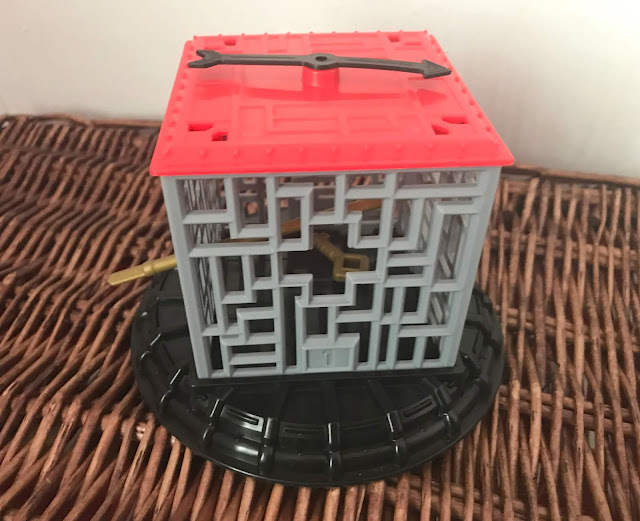 The first challenge you have to fish a key out of a maze cube, tensions run high when you drop the key or can't fit it through the gaps! Next up it is puzzle time, for this challenge you have to answer questions from a choice of easy, intermediate and hard cards. 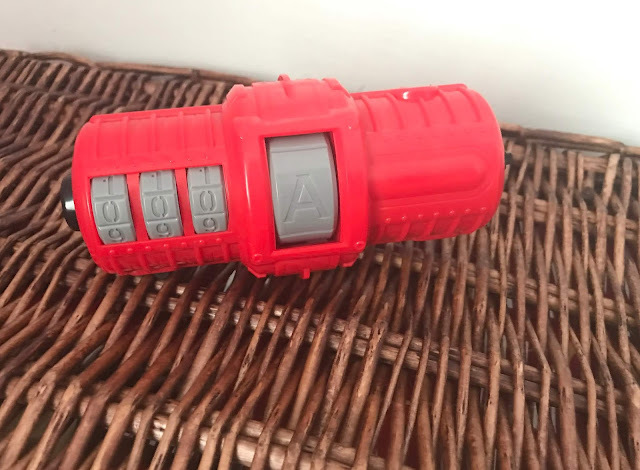 When you answer the question you then add it to the quiz device and when you get three correct questions you can grab the key to help rescue your teammate. If you get the question wrong you have to start all over again. 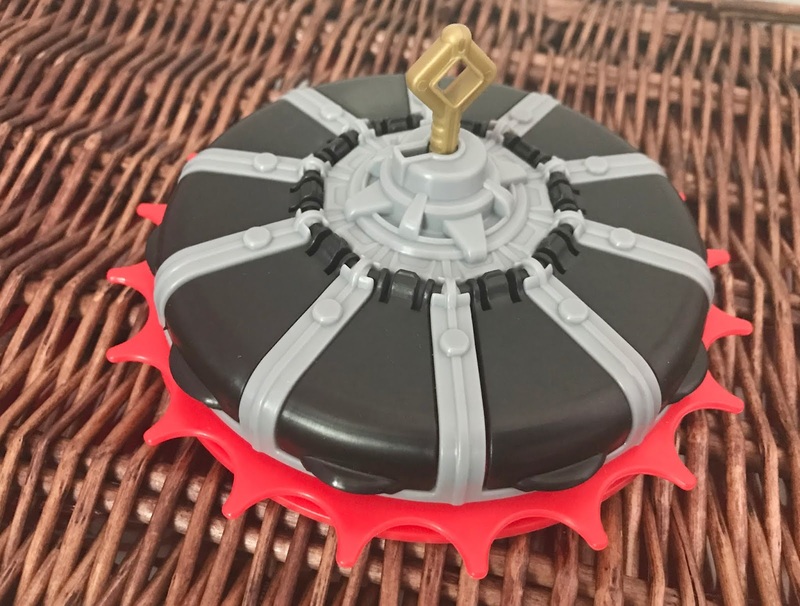 The last challenge a lucky spinner, spin the spinner and see if you can open the correct compartment to find the final missing key. When you have all the keys you can then free your teammate, yay! Each time we played this game it was different and it took different lengths of time to complete as it all depends on how quick or lucky people get when completing the challenges. It is such a fun game with lots of shouting, cheering, determination and teamwork involved. The children really enjoyed playing this game as it is not like any other game we have played before, I even enjoyed getting involved too. 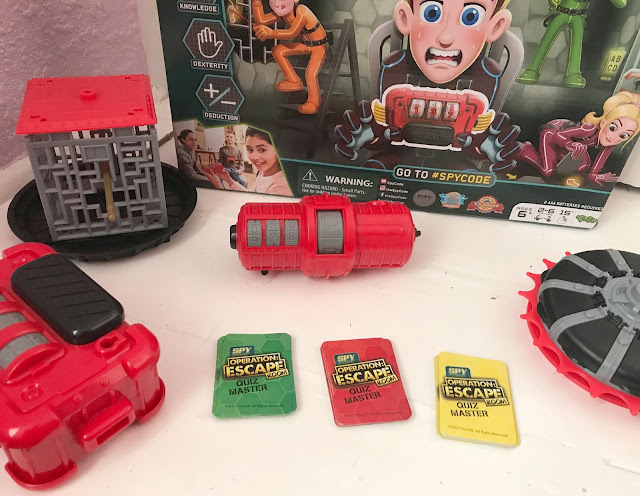 Operation Escape Room is available to buy from Smyths now priced at £19.99 and I am sure it will be a great hit with slightly older children this Christmas, it is a great game the whole family will have fun playing together. Disclosure I was sent this game for the purpose of this review and received a voucher for my time. this looks brilliant! alan obsessed with escape rooms at the mo and looks like great fun.